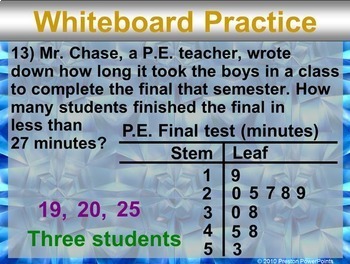 This slideshow lesson is very animated with a flow-through technique. 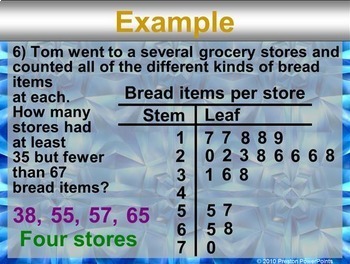 I developed it for my Algebra 1 class, but it can be used for lower grades as well. 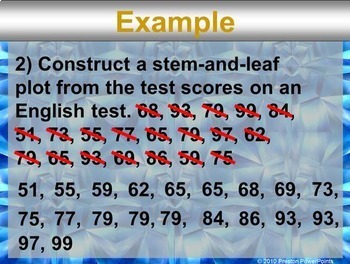 This lesson was one of a chapter that was used as a review for all previous grades. 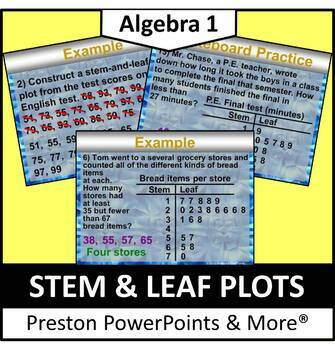 The lesson teaches how to interpret data from the stem-and-leaf plot and make and use a stem-and-leaf plot to put data in order. 4. Understand that patterns of association can also be seen in ivariate categorical data by displaying frequencies and relative frequencies in a two-way table. Construct and interpret a two-way table summarizing data on two categorical variables collected from the same subjects. Use relative frequencies calculated for rows or columns to describe possible association between the two variables. *This lesson contains 14 problems. Each problem in this lesson uses several pages in order to achieve the animated flow-through technique.